The Nebraska Department of Education has released the “initial” 2015 NeSA (Nebraska State Assessment) results. The assessments were taken during the Spring of the 2014-15 school year. The results show the Elgin Public students performed very well in all areas of the test. All students in grades three through eleventh are tested in reading and math, in addition grades five, eight and eleven are tested in science and fourth, eighth and eleventh also take the state writing exam. The students and teachers are to be commended on their great efforts not only on the test but their efforts throughout the year. Well done! Students had perfect scores in one subject were: Front row: Willam Heilhecker (Reading), Baylee Busteed (Math) and Trenton Reel (Math). 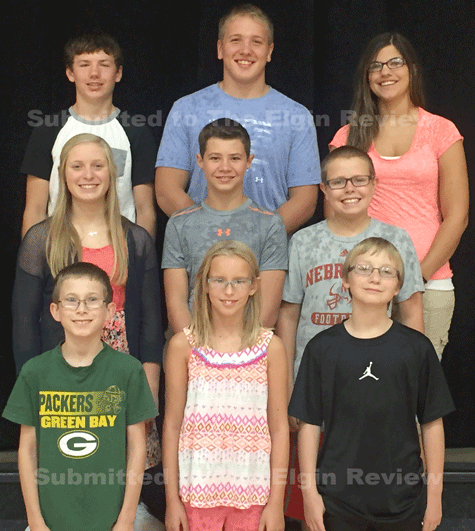 Middle row: Allyson Wemhoff (Writing), Kan VonBonn (Math) and Ethan Hinkle (Reading). Back row: Hunter Reestman (Math), Alois Warner (Math) and Kaitlyn Polk (Writing).